The group of 49, including four women, earned certificates after completing a training programme in road traffic policing which covered human rights, ethics, gender, child welfare and key legislation. The training, held from 30 October to 22 November, was organized by the MONUC Ituri senior police officers and their colleagues in Kinshasa, with support from the mission’s Human Rights Division and the local Red Cross. 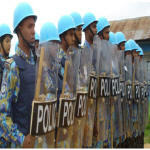 Over 100 Congolese police have also recently received training in law and order and professional intervention techniques, according to MONUC.